I spent a few days in Montevideo, Uruguay, earlier this month to see the G1 Gran Premio José Pedro Ramírez, contested at the historic Hipódromo de Maroñas. Held each year on Jan. 6, the Ramírez is Uruguay's most famous horse race in a country that truly appreciates the horse and horse racing. Uruguay is small, both in size and population. Its 68,000 square miles is similar in size to North Dakota, Oklahoma or Missouri. Population wise, Uruguay has just under 3.5 million residents, with 1.4 million living in Montevideo, the capital. Situated about 125 miles east of Argentina's largest city, Buenos Aires (reachable by ferry in a few hours), Montevideo is at the mouth of the River de La Plata, which empties into the Atlantic Ocean. Though deep in South America, Montevideo has a European feel to it, having been established by Spanish soldiers in the early 1700s. The country's economy and political atmosphere are stable and currently it is widely thought to have the best quality of life among all Latin America countries. The country is well known for its agriculture, especially cattle, and Uruguayans say they have some of the best beef in the world. I'm not sure a vegan will find much company there. 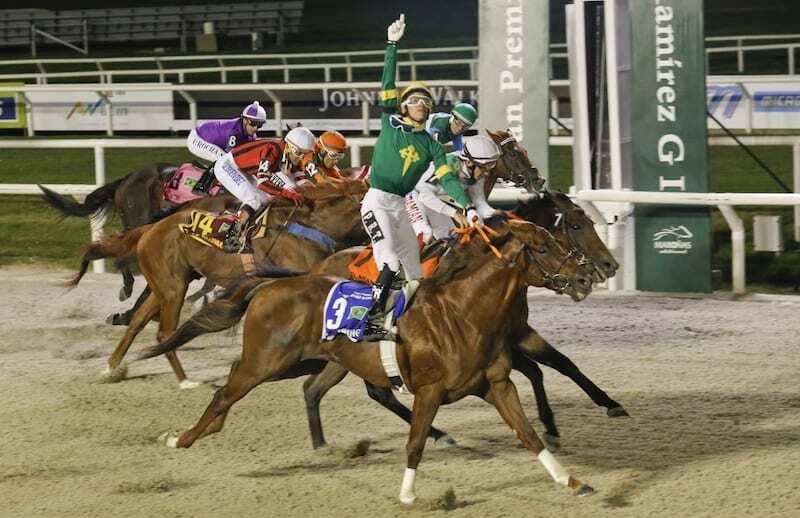 Racing in Uruguay has grown healthier since the 2003 reopening of Maroñas – the country's largest track – and a stable breeding industry is similar in size to Florida's with between 2,500-3,000 mares bred annually. The Jose Ramirez was one of 21 races run on the Jan. 6 program (first post 12:40 p.m., final race at 10:15 p.m., so it's a marathon). Average field size on the day was 13 runners, many of them imported from Brazil and Argentina, where governmental policies have been a detriment to racing and breeding. In fact, Pico Perdomo, who returned to his native Uruguay after a lengthy and successful training career in the United States, said almost all of his owners come from outside of Uruguay because of the stability of the racing program and the low cost to keep horses in training. Uruguayan politicians have spoken publicly about the importance of Thoroughbred racing and breeding in their country, and more than a few of them were on hand for the day's races at Maroñas. Codere, which operates Maroñas along with Uruguay's second-largest track, Las Piedras, has made significant investments, building a new turf course at the Montevideo track, constructing additional barns in the stable area and purchasing high-definition cameras to improve the production quality of its simulcast signal, which the company is actively marketing to tracks and advance deposit wagering companies in North America. Codere, a publicly traded Spanish company, also owns or operates racetracks in Mexico, Panama and Brazil and has a large casino footprint in Europe and Latin America. One thing that can't be gauged monetarily is the passion that Uruguayans and other Latin Americans have for racing, especially for winning. American racing fans got a taste of this when The Stronach Group brought the Clasico del Caribe to Gulfstream Park in 2017 and '18 and saw the nationalistic pride of the winning connections from Mexico, Panama, Venezuela and Puerto Rico as they competed against one another. On Ramírez day there were 21 exuberant celebrations that spilled from the grandstand to the winner's enclosure; lots of hugging and shouting and tears of joy. I'm always amazed at how the winning horses never seem phased by it when they are suddenly engulfed on all sides by the revelers. One such celebration on Ramírez day was larger than the rest when people from a small town in northern Uruguay packed into several buses and came to Montevideo to cheer on a local favorite. When the horse won, an endless stream of people poured into the winner's enclosure, with one observer remarking that the entire town must have been there. As for the Ramirez, there was plenty of drama when Pablo Rodriguez guided Brazilian-bred First Thing to a last-to-first victory in the 2,400-meter dirt contest (about a mile and a half). At the end of the long stretch run when the narrow victory was assured, Rodriguez immediately began thrusting his hand to the heavens in honor of a brother who had been shot to death days earlier on the streets of Montevideo. 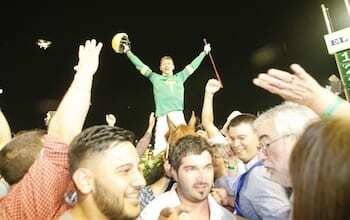 It was a spirited and emotional celebration for the 23-year-old rider whose first G1 victory had come with First Thing in November. Now he had won his country's most important race. The day took a bizarre twist just before the jockeys were to mount up for the Ramirez. Among the riders lined up on the presentation stand while a band played Uruguay's national anthem (said to be the longest in the world) was Pablo Falero, one of the sport's all-time leading jockeys with more than 9,350 wins. The 52-year-old Falero – who began his career in Uruguay but made his mark in Argentina – had recently said he would soon retire and that this would be his final Ramirez. It was a hot, muggy day, and Falero apparently was not feeling well. He put his hand to his mouth, then suddenly collapsed, falling forward down a short flight of steps to the ground. As fellow riders watched in shock, medical staff treated Falero for several minutes before an ambulance took him to a nearby hospital, where he was treated for facial cuts and dehydration. It wasn't the kind of grand finale Falero or his many fans had anticipated. I've had the opportunity to go racing in 16 different countries on six continents. There's something to like about every single track I've visited, and there's a lot to like about Maroñas, as well as the people of Montevideo and the passion they have for racing. If you like international adventures, put this spot on your bucket list. This entry was posted in NL Article, Ray's Paddock and tagged Clásico Gran Premio José Pedro Ramírez, codere, Maronas, Ray Paulick, Uruguay horse racing by Ray Paulick. Bookmark the permalink.